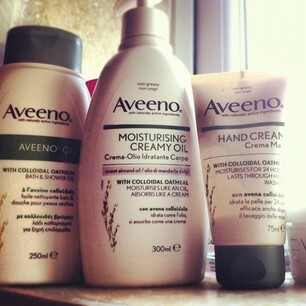 I've been using Aveeno products for a while now, and realised I've never blogged about them, which is a little rude of me, keeping these little gems to myself. If you've got dry skin, irritated skin or eczema, then chances are you might already know the range, as it's such a good, non-irritant moisturiser that even doctors will give it to you on prescription, to alleviate a huge range of dry skin conditions. They have been expanding their range from the tried and tested Daily Moisturising Lotion. I've loved the Moisturising Creamy Oil for a while now. It's very runny and wet, and a little goes a long way - you'll just be at the point of thinking that it's too wet, and is never going to sink into your skin when just like that it disappears, leaving a wonderfully moisturised limb. It's almond scented, and has a light, sweet marzipan smell, which practically disappears after it has been absorbed. And the Hand Cream is the best, cheapest cream on the market, in my book. It's unscented and deeply moisturising without being one but greasy. It even claims to be able to withstand washing your hands. Tough stuff. Lastly, the Bath and Shower Oil will leave your skin incredibly soft after a shower, and this product has the advantage of being both a showel gel and a bath oil. The texture is like a thick jelly-ish oil, and you can either apply it directly onto the skin in the shower, or add it to a bath. The only problem I had with it was the smell - an overly sweet scent which seemed to be masking a stale dog-biscuit type smell underneath. Strange. And you have to keep smelling it because it's both puzzling and intriguing at the same time. But at least it doesn't linger on the skin.